Offering NeurOptimal equipment and start-up training for clinics and personal use. It is very simple for you to offer Neurofeedback at your clinic or private practice or for you to experience Neurofeedback training in the comfort of your own home. We use, recommend and sell Zengar’s NeurOptimal neurofeedback system and add our own Brighten the Brain training courses and support. If you are interested in offering Neurofeedback at your clinicians or private practice, or for individual use, please contact me to learn more. Call 970-352-8873 or email LoriGrace@brightenthebrain.com with "Request NeurOptimal Info" in the subject line. The NeurOptimal® Business Start-Up Bundle is a true out-of-the-box solution for all your equipment and educational needs as you build your NeurOptimal® practice. This offer includes up to five systems of your choice. Customize your bundle to meet your needs! You will also receive 2 Online Course registrations with your bundle, of which you’ll get to choose the courses that fit your schedule and your needs! Want to have more knowledge and training to confidently position yourself as a skilled NeurOptimal® Trainer? Our Online Basic and Advanced* Certifications courses (available in French and in English) will provide you with just that and more! Looking to gain a better understanding of opportunities as you grow your business? The “Starting a Successful NeurOptimal® Business” workshop is an interactive day full of information about basic business process to help you get there.Topics covered in this business workshop include: Choosing an Effective Name, Designing the Right Business Model, The Basics of Developing a Business Plan, Social Media Marketing, and Getting Clients Through Your Door. All systems will be covered under PASS Enterprise for 6 months which will provide you with a slew of benefits (Click here for full comparison chart), notably tech support and instant access to PASS discounts and the Ambassador Program. We’ve also developed a special financing program specifically for this Bundle with interest rates starting as low as 0% and with terms extending up to 30 months. Click here for more information about terms and conditions based on your location. Join our wonderful community of thousands of trainers worldwide who offer their clients the life-changing technology of NeurOptimal®, with this turn-key NeurOptimal® Professional system. offers all the power of Neuroptimal® training in a lighter package. 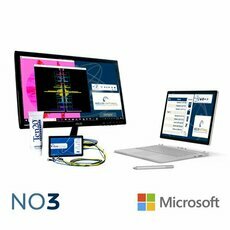 This turn-key system ships on a Surface Pro 6 (i5) tablet for the most portable NeurOptimal® system yet. All systems are shipped with Windows 10. Please note that Windows 10 (specifically Windows Media Player) does not natively support DVD playback and therefore DVDs cannot be used with NeurOptimal® software. For more info email LoriGrace@brightenthebrain.com with "NeurOptimal Purchase Questions" in the subject line.